I haven’t been around on Twin Cities Geek for a while. The truth is, I haven’t been around much of anywhere lately because I am actually now a sad vampire. Long story. “Whoa, whoa, wait!” you are probably exclaiming with some slightly defensive and universally understood hand gestures. “This is a lifestyle and culture website and not a place to unload your personal dramas!” But look. Regardless of whether unloading the contents of one’s fractured psyche into the cold, uncaring, and anonymous void of cyberspace is a healthy coping mechanism or not, it is relevant this time. Trudging through the swamp that is sadness (like in The Neverending Story!) means sometimes practicing self-care, lest you become stuck and sink into the metaphorical muck of hopelessness and apathy like a certain horse buddy. (Now you’re sad.) Self-care can take many forms, and one of the methods that has become increasingly popular is mindfulness. Adult coloring books have been popping up everywhere and in every form, from nature (soothing!) to licensed material and fandoms (exciting and legally dubious!) and, apparently, themes near and dear to my heart. 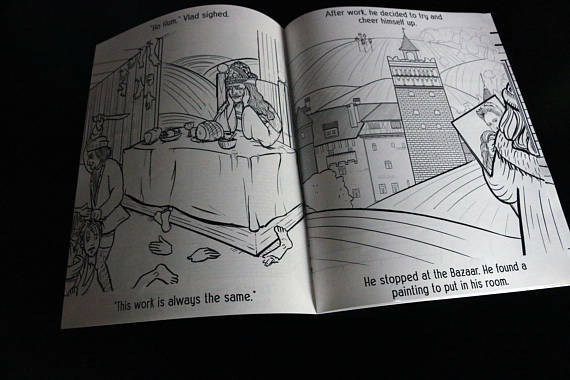 Enter the Minnesota-created Vlad the Sad Prince: A Coloring Book, written by John Komarek and illustrated by Stephanie Ritter. 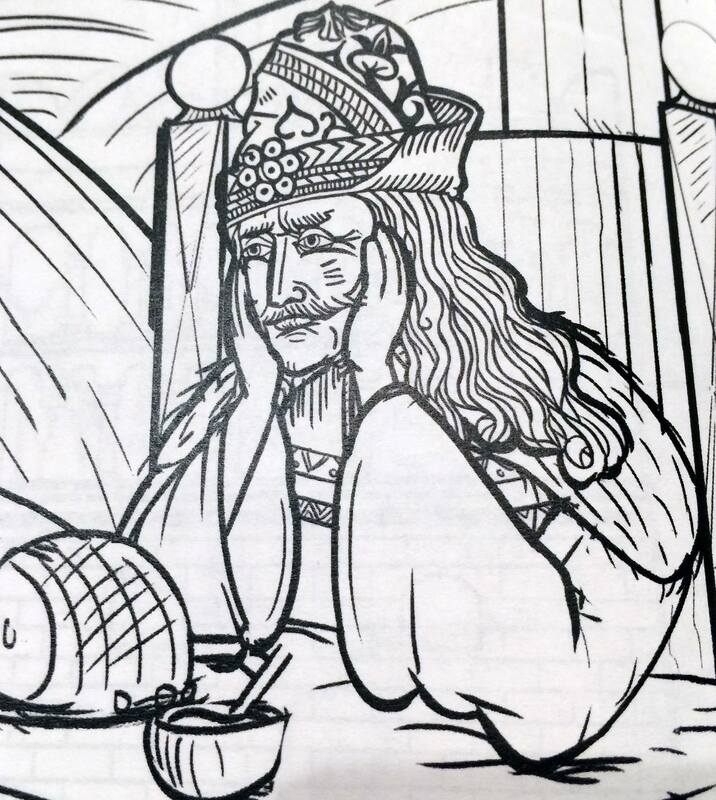 Taking inspiration from the iconic woodcuts of Vlad the Impaler, Vlad the Sad Prince delves into the melancholy of Vlad III over his lack of work-life balance and the soul-crushing tediousness of his profession. Relatable content indeed! But after some sage advice is dispensed by a dreamy visitor, the good prince is able to find that perhaps his melancholy is not the result of a demanding job. Perhaps his sadness comes from within. More, Vlad is able to see that perhaps his sadness isn’t really sadness at all, but a matter of perspective. That is . . . huh. Surprisingly deep for a coloring book. The story is cute, if very short. The coloring book hosts 16 pages of line illustrations, including plenty of heads on spikes and disembodied appendages. The art is whimsical and funny, especially the couple of Easter eggs for fans of the classic vampire genre. The audience for this book is clear—while its illustrations would indeed work for actual coloring, it’s worth more for its humor as a novelty item. The woodcut art style suits itself perfectly to a coloring book, but so much of the scenery consists of bricks, either in the background or in buildings, that actually coloring all the pages might feel a bit tedious. The line work is intricate enough for colored pencils, the standard for adult coloring books, but thick enough for markers and crayons. However, when I tried to color my copy using my own blood (I mean, come on) all the details got lost in so much of the same color. Then again, it could have also been dizziness from blood loss, or I may have accidentally summoned the demon Ag’thimul again, so let’s not be too critical here. At the end of the day, this is a fun little book. While I may or may not still be a vampire, I’m now a little less sad. 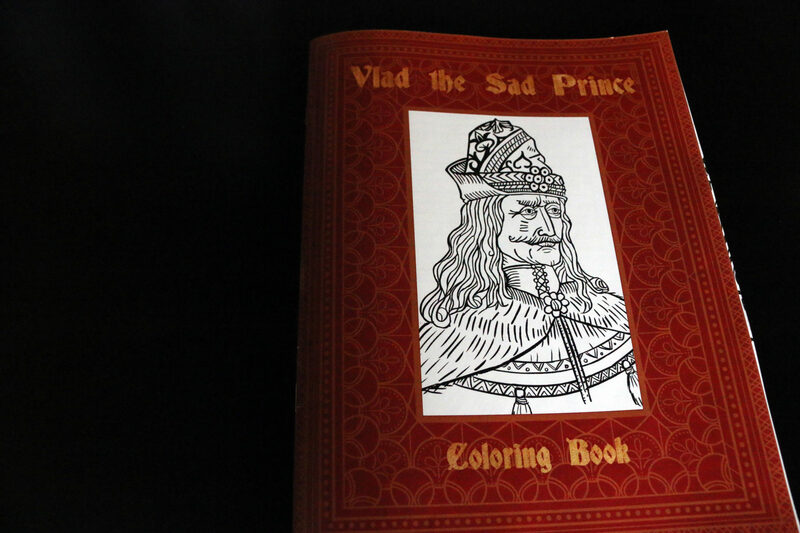 You can buy Vlad the Sad Prince: A Coloring Book for $10 plus shipping on Etsy and follow Sad Vlad on Facebook or Twitter.